I realize everyone is writing about Periscope and Meerkat right now. I realize I’m not contributing to the content marketing vortex. Yet, when I read most of these posts, I don’t see too many people talking about the realistic implications for brands. Sure, I see the upsides. I’m excited. I get all the opportunities. But, with everyone urging brands to jump in, I see very few people (as usual) talking about the nuts-and-bolts of what this means on a corporate level. For example, as with any new tool, on the corporate side there can be a resistance to try something out right away (contrary to what people think about the “shiny object syndrome”). Convincing companies to experiment with a new tool can be tough (not everyone is Mtn Dew or Red Bull). So, you have the adoption issue right off the bat. But, I see a handful of other issues I’m sure midsized and larger companies will struggle with when it comes to Periscope and Meerkat, too. Meerkat and Periscope use “ephemeral” video (I can never say that word). It’s here one minute. Gone the next. Cool for kids and people who love tools like Snapchat. Not so great for brands who like to actually see something they’ve worked hard to create for more than 30 seconds. Brands want to show off. Brands want content they can stick in an archive and refer back to at some point. Brands want content they can stick on the web and make searchable, so people visit their site and buy stuff from them. The archiving aspect of this is a big turn-off for brands, I think. 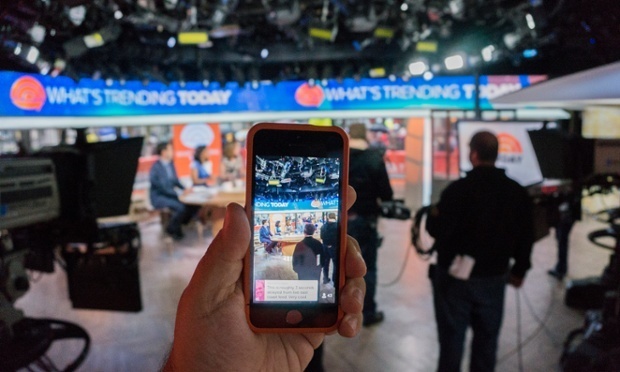 Note: Periscope does offer brands the chance to save a video for 24 hours. So, you take the video, You stream the video on Twitter. You interact with fans. Then, it’s gone? Isn’t that the conversation marketers are having with management right now? The “ephemeral” video component of this should not be under-played–that’s a big issue. Sure, for people who use tools like Snapchat, this is second hand now. But remember, not all brands are using Snapchat. And, most brands have egos–very large egos. So, if they put a lot of time and effort into creating video content, they want that video content to then live on their YouTube channel where people can like, comment and share it. They want to use it in e-newsletters. They want to point to it from advertising. The “ephemeral” aspect of video can actually be a huge turn-off for brands. Some brands still over-think video. For many brands, video is still a big production affair. Videographres. Assistants. Full-day shoots. That’s video for a big company (not all, but I’d say many). It’s also costly since they typically don’t have the resources to do video in-house. So, along comes Meerkat/Periscope. You can now livestream video on your iPhone. Cool! But here’s the thing: Most brands may think that’s “cool”, but it’s not remotely “doable.” They’re simply not comfortable with it yet. Again, I’m not talking about ALL brands here (I just saw Target do some interesting things with Periscope for a product launch this week). But, I do think this is a big issue for a LOT of brands. This involves legal. This involves management. This involves governance. Once brands can dot all those is and cross all those ts, we may be in business. But, that’s going to take a while. Don’t get me wrong–I’m just as excited about the possibilities for brands around livestreaming video as you are. But, I also want to be realistic. And, as someone who’s worked for big companies before, and as someone who consults with big brands now, I can tell you–there are hurdles. And, they are very real. So, maybe we just need to be a bit more realistic about how this all unfolds. Brands and marketers are excited about livestreaming video, sure. But implementing it might be a bigger challenge than most people think.